Finally it happened - the moment the whole world was eagerly waiting for. When an American girl married England's prince & said their ‘I Do’s’. Yes, I’m talking about ‘The Royal Wedding’ which took place at St George's Chapel in Windsor Castle! A fairytale does-not get more real than this - because this really was a Royal wedding in every sense. Prince Harry and Meghan Markle are Husband and wife now, and will officially go by - Duke and Duchess of Sussex. Prince Harry has now officially become His Royal Highness The Duke of Sussex, and Ms. Meghan Markle is now Her Royal Highness The Duchess of Sussex. Prince Harry meeting the well-wishers outside the castle. Megan's ring is a gift from Her Majesty The Queen itself. It’s a fashioned from a piece of Welsh Gold while Prince Harry's is a Platinum Band with a textured finish. Also, both of them are from Cleave and Company. She drove in to the castle with her mum, her mum got down arriving to the drive away and she rode with with the twin sons of her best friend, well-known Canadian stylist Jessica Mulroney. Meghan made a stunning Royal in a custom made Givenchy Haute Couture gown by Clare Waight Keller. Queen Elizabeth lent Meghan Markle the tiara she's wearing today, Queen Mary's diamond bandeau. It was made in 1932, with the entre brooch dating back to 1893, the palace says. "I Harry take you Meghan, to be my wife, to have and to hold, for richer for poorer, in sickness and in health, to love and to cherish, til death us do part." The flowers are being called "very American" and "wild" and many had to be added at the last minute. They are all locally sourced peonies, foxgloves and white roses, which are a special nod to Princess Diana. Where they took their wedding vows. The British monarch wore a delicately flared dress in lime, lemon, purple and gray printed silk, designed by Stuart Parvin. She has completed the outfit with an Angela Kelly hat, using the same lime silk tweed with sinamay and adorned across the crown with handmade lace crystals and pearls made by Lucy Price. 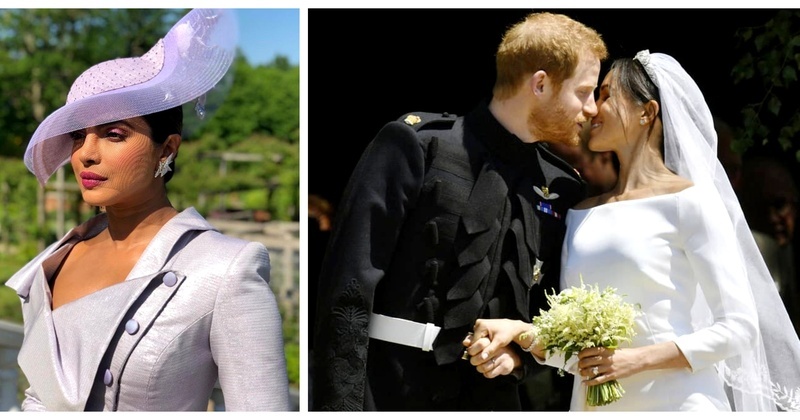 Her brooch is The Richmond Diamond Brooch with pearl drop. The Duke of Edinburgh is wearing a morning suit. While Priyanka, despite sharing a close bond with Meghan, is not her bridesmaid, she is still the only who has made it to the exclusive guest list of the royals from Bollywood. Oprah Winfrey arrived in a pink dress, a cream-colored hat adorned with pink flowers and a pair of sunglasses looking her elegant self. She sat in the Quire with the family and other close friends — not the main body of guests. Amal Clooney was definitely the best dressed guest in a mustard Stella Mccartney. In love with her pastel green floral dress from The Fold. P.S., totally digging her cardigan like dress. They are the 16th Royal Couple since 1863. …..and the ceremony ended with the usual ‘God Save The Queen’.